During my night watch last night, the wind picked up a little as a few big dark clouds passed over, spritzing a little rain. The sailing wasn't very satisfying, though, because the winds were variable, keeping me busy tending the boat: First, set the traveler one way, then set it the other way, then re-set it the first way (re-rigging the preventer each time). The wind appears, so unfurl the headsails; the wind disappears, so furl the headsails. After every change, tweak the autopilot heading this way or that way. Despite all these efforts, we still couldn't follow our course line because of the westward-setting current. At midnight the watch changed and David came into the cockpit. Before I could go below the fishing reel started clicking, so David tended the fishing pole while I tended the boat. Normally we like to stop the boat while a fish is retrieved, but this time I had some trouble. I headed up into the wind but turned too sharply and accidentally tacked; both headsails went aback. I tried to furl the headsails but had difficulty since they were aback. In the heat of the moment, both David and I were scampering around on-deck without using our harnesses, which was risky at night on a rolling boat with wet decks. Once David reeled-in the line, instead of having hooked a fish he found the hook snagged on a long green fishing line, the same kind of cursed line that fouled the propeller in Academy Bay. He unsnagged our hook without losing any tackle, then dropped the long fishing line back into the ocean, hoping that Nine of Cups would sail over the line without snagging it below. This apparently was a success because we didn't see any line trailing astern. While futzing with the fishing tackle the boat had wandered on its own, and we were now pointed in the wrong direction. Without much wind it can be difficult to turn the boat around, but there was enough wind to unfurl the jib and do a controlled jibe, restoring our correct heading. Later in David's night watch, our fishing lure snagged another drifting fishing line, but this time our tackle could not be retrieved and David had to cut our line. Also on David's night watch, the wind suddenly came up strongly and the boat began plowing and plunging through the waves. With full main and jib the boat was significantly overpowered, and Marcie and David labored for some time to reef the main and jib. They put three reefs in the main and roller-reefed the jib to the size they wanted. Once the jib is roller-reefed, though, you have to use a sheet winch to tweak the furler control line as the tension is too high for hand operation. The GPS recorded the boat speed during the romp, which averaged a solid eight knots and topped-out at 10.3 knots—a lot faster than the pokey couple of knots we've been averaging lately. The downside of the boisterous sailing is that I spent an uncomfortable night being tossed around in my bunk. It was basically impossible to drop off into any kind of sleep, due to the continuous vigorous motions of the boat and the strong heel to starboard. 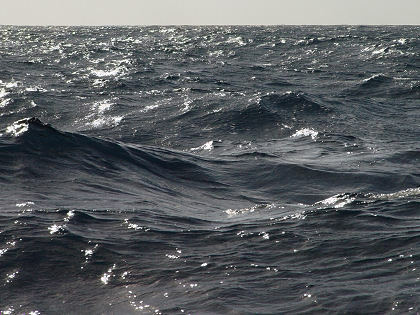 Stronger winds create boisterous sailing conditions but also lumpy seas. After I got up for my morning watch, I found it difficult to walk around below. I had to lean way over to counteract the heel, and then brace myself against something or hang on tightly to keep from being thrown about by the constant rolling and pitching, plus the rising and falling of the bow. The day passed quickly and we made good progress. As usual, it was very enjoyable and entertaining to sit in the cockpit and watch the long slow undulations of swell lumber up from the south then rise up as they approach the boat, lifting us bodily and lowering us back down on the other side of a broad rolling hump. During the late afternoon, David got another hit on the fishing line; this time it felt like a real fish. Unfortunately, the fish broke the line and we lost the lure. There wasn't enough line left on the reel to troll so David refilled the reel with different line. I didn't get any sleep last night, so on my night watch I was very tired and could hardly keep my eyes open. Another factor is that my body is getting used to a whole new physical situation (the heeling, pitching, and rolling), and has to adapt to the new sensations and learn what is normal. Plus I still have to find a comfortable sleeping position in the berth when we're heeled over.